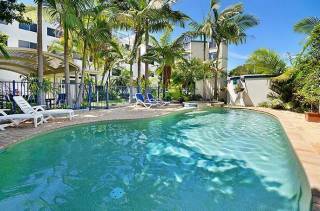 Ideally located a short drive north of Brisbane, Sandy Shores holiday apartments are on beautiful Golden Beach, Caloundra - The gateway to the Sunshine Coast, Queensland. 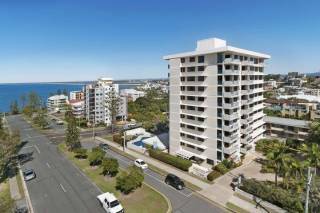 Luxurious one, two and three bedroom Caloundra Holiday apartments feature ensuites and huge balconies with spectacular views of Pumicestone Passage, Bribie Island and The Pacific Ocean. 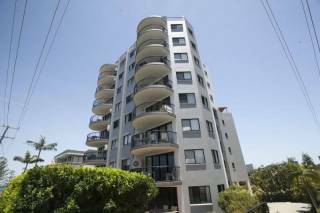 Shopping, the CBD and restaurants are all within a 5 minute walk. 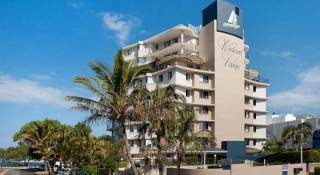 Sandy Shores holiday apartments are the perfect location for an overnight visit, family holidays or extended stays. 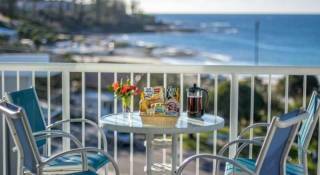 These fabulous holiday units are metres from the beach and have a heated pool and BBQ. Pumicestone Passage is an internationally recognised marine park home to dugongs, dolphins, turtles and varied birdlife. The sheltered Pumicestone Passage provides safe swimming, sailboarding and superb fishing. Skydiving, swimming, surfing, Kit Surfing, canoeing, boating, jetski, beach activities, fishing, shopping, walking tracks, roller skating, Ginger Factory, Australia Zoo, Underwater World and close to the hinterland towns of Maleny and Montville in the Blackall Ranges. We look forward to seeing you at Sandy Shores on Golden Beach, Caloundra! Located close to the North Street Sports Stadium.